It's Leap Year Day, it's Wine Wednesday, it's the end of February and it's time I actually posted something. Fuzion Alta 2010 Reserva Malbec (Argentina) - I don't care what anyone says about Fuzion, their wines are YUMMY! This one went exquisitely well with the BRIX 80+ per cent dark chocolate sitting in the background. At $9.95 a bottle, you simply can't go wrong. (The word 'reserva' on the pretty gold label, with all that cursive writing, makes it look like you spent more than you actually did!) And look - it's a screwtop! It took me a while before I actually had a taste, I was so in love with the exquisite nose of cigar box, smoked meat and raspberry syrup. It was juicy and fruity, but still showed restraint and maintained its elegant posture through the long finish. Inniskillin Tenacity Red and White (Niagara) - This was a total impulse buy. Those guys at the Loblaws' Wine Rack must have seen me coming a mile away: tired, irritable, overextended mom trying to get the last of the groceries done before her toddler completely melts down. Would you like to try a sample? Why YES, YES I WOULD. The white is a blend of chardonnay, riesling, moscato and gewurztraminer, with the moscato featuring prominently with its succulent sweetness. Like Sandbanks Shoreline, this will make for a perfect sub-in until Obsession gets back into stores. 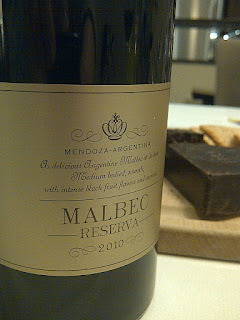 Fragrant, with loads of exotic fruit and sharp acidity slicing through the medium-bodied feel all the way to the finish. The red is an interesting blend of cabernet franc, pinot noir and merlot. Not as much of a fan of this as I was of the white, but it's a good mid-range crowd pleaser, with plenty going for it as a match with pizza, burgers, spaghetti night or a simple steak. Plenty of fruit with a dry feel and a mere hint of oak.